Damon gave her a new nickname this week: Wolverine. That was my cue to clip those fingernails. She can now pull the cord in her bouncy chair that activates the music. Go Marlie Go! She has discovered the TV and computer screens. She has started to lean toward things she wants to touch...like her daddy. So sweet! I just noticed that she has her daddy's charming smile (see photo for proof). We finally bought a stroller! Isn't it beautiful! 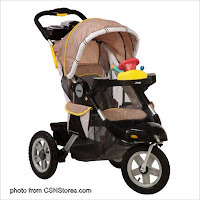 The Jeep Liberty Limited Lightweight Stroller is not lightwe ight, but it's durable and easy to maneuver over the parts of our neighborhood that don't have sidewalks. The thing is like an all-terrain vehicle! Marlie loves to ride in it while mommy gets her exercise on. That smile is the one she will have when she dates and says, "Gee Mom, why can't I stay out later?" I love that when they can finally activate the toys, I remember when Abby did that on her bouncy seat. You are so wonderfully lucky to have her . . and her you . . and that stroller . . . to die for! Go Marlie . . Mwahhhhhhhh!!!!!! The stroller looks great, wished I had one when my kids were in need of it. She is adorable. Who couldn't smile back at her?